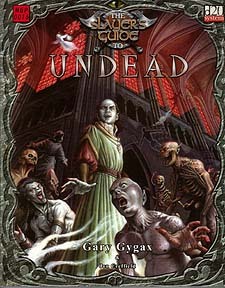 Written by the father of gaming himself, Gary Gygax, the Slayer's Guide to Undead is a 128 page book jam packed full of new information on creatures of the night. From the humble skeleton, through the dreaded wraith, to the most powerful liches of all, this Slayer's Guide will revitalise any campaign with new and exciting way to bring the dead to life. New creatures are fully detailed, along with tips on how to use undead in campaigns and fill players with dread whenever they appear. A complete mini-scenario, penned by Gary Gygax, is also included to set players off in the most desperate quest they will yet face. * The Unwilled Living Dead Skeletons and zombies might well seem to many to be boring and of little threat to an accomplished party of adventurers, however, they can be so much more. Detailing the less intelligent but certainly not less undead creatures, this chapter offers a mini-slayer's guide on each of the unwilled undead creatures presented. * The Free Willed Living Dead Many adventurers flee in terror from the ghast or ghoul and they are but the least of the free willed undead creatures presented in this chapter. With new templates, tactics and more each creature is detailed in a full and comprehensive manner. * Spirits of Evil Few things offer as much terror to a party of adventurers as a creature they cannot hit. Ghosts, ghasts, wraiths and more are all covered in the context of an individual slayer's guide on each, including scenario hooks and new forms of the ghostly. * Lords of the Living Dead From legend to your gaming table, vampires, liches and worse offer the opportunity to truly terrify your player's characters as they try to contend with those who have mastered death. * The Peak of the Nightlord Drawing on the material presented within this book, a full mini-scenario is included.